HIF Emergency Household Water Filter Challenge: Evaluation Matrix and Report | Village Water Filters Inc.
Download the PDF of this report here. This work is funded by Elrha’s Humanitarian Innovation Fund programme, a grant making facility supporting organisations and individuals to identify, nurture and share innovative and scalable solutions to the most pressing challenges facing effective humanitarian assistance. The HIF is funded by aid from the UK Government. Visit www.elrha.org/hif for more information about their work to improve humanitarian outcomes through research, innovation, and partnership. Safe water provision is one of the top concerns immediately following a sudden‐onset emergency and, at the same time, is one of the persistent concerns during humanitarian response to complex emergencies. Because each emergency is unique and no one solution can be applied across emergencies, a number of approaches have been developed to address the need to provide safe water, from bulk chlorination and distribution by tanker trucks, to point‐of‐use products for water treatment at the household level. Within the suite of household water treatment (HWT) products, filters have received increasing attention with regards to their potential application in emergency situations. In parallel with this increasing attention, there has also been increasing effort to develop household water filters, and as a result, significant progress has been made in terms of the number of filter products available. However, in spite of increasing interest in and availability of household water filters for use in emergencies, there remains a gap in evidence on the effective use of these filters emergency contexts. Specifically, although some filters have been tested in the lab under controlled conditions and/or in the field in development contexts, the results of this testing are not representative of the conditions faced in an emergency context. Furthermore, methods and protocols for the evaluations that are performed on filters in emergencies range widely, and the results are rarely systematically documented or widely shared. To be the filter testing partner. To have your filter tested in the field (by the chosen filter testing partner). To receive an innovation grant to support the further development of your filter. In the first call, applicants were to propose a research protocol by which filters would be evaluated, with the goal of collecting robust evidence on the ease of use, performance and suitability of existing HWT filters in a number of emergency contexts. The selected Research Partner will carry out the proposed research on a selected set of filters, which will be identified in the second call. Towards that end, the objective of the second call is to identify up to five existing filters that merit further testing in different emergency settings. The final output of this and the first call will be a comparative review of the tested filters published by the HIF that publicly presents the outcomes of the field testing. An additional output will be an online catalogue of all the relevant filters submitted for the call, which will be found on CAWST’s Household Water Treatment and Safe Storage (HWTS) Knowledge Base (www.hwts.info). Finally, the objective of the third call is to support the development of HWT filters with the humanitarian emergency context in mind. Specifically, this call focuses on those working on early‐stage filters for use in emergencies, or those working to adapt existing filters for this context. Up to three proposals will be chosen to receive funding to support filter research and development. These selected proposals will also receive feedback and mentorship from the HIF and its WASH Technical Working Group (TWG) members. CAWST is a Canadian centre of expertise in sustainable, non‐networked drinking water and sanitation treatment technologies for use in low‐resource settings. CAWST’s staff is primarily composed of environmental engineers and specialists in education program development, many of whom have direct experience with HWT in the field. All staff in CAWST’s Research Learning Department focused on different aspects of water, sanitation and hygiene (WASH) for their doctoral research. In addition to being a leading expert in HWT, CAWST has no vested interest in the entities associated with HWT 2 product manufacturing. CAWST was contracted as a technical advisor to the Challenge in November 2016, specifically to support the second call. The purpose of CAWST’s work was to provide additional analysis to support the HIF TWG in its decision on which filters will be evaluated by the Research Partner chosen in the first call. Toward this end, CAWST conducted a desk review of HWT filters for use in emergencies and interviewed humanitarian agencies that use HWT filters in emergencies. From this, CAWST developed and applied an evaluation methodology to assess existing filters against the Challenge criteria. The list of filters considered for this evaluation was generated during the desk review and was updated to include filters submitted to the second call, if these products were not already on the list. The purpose of this report is to support the evaluation matrix for use by the HIF TWG. For some of the evaluation criteria, information was not readily or publicly available for most of the filters considered. Through our expert interviews, we were able to gain insight into some filters with regards to these criteria. However, because this information was not consistently available across all filters, we did not use this information in the evaluation matrix. For products for which this information was documented and available, this information will be included on the HWTS Knowledge Base. The updating of information and addition of relevant filters to the existing list of products on the HWTS Knowledge Base will happen outside of the timeline of the second call. The recommendations from the evaluation are not intended to serve as recommendations to the humanitarian response sector regarding which filters to implement in emergencies. The scope of this evaluation is limited to a desk review and evaluation of filters – based on the specific criteria identified by the HIF TWG and the weightings given by interviewees – to determine which filters are interesting for further study in emergency contexts. In this report, we first present in Section 2 our methodology for filter identification and selection as well as the weighting process and expert interviews. In Section 3, we present an overview of the filter types – ceramic pot, ceramic element, membrane and other – and then provide brief introductions to the 34 products evaluated. In Section 4, we detail the evaluation criteria and the corresponding scoring rubric for each criterion, which was used in developing the evaluation matrix tool and scoring the filters within the matrix. In Section 5, we present the results of scoring the filters and applying weightings from interviewees in the evaluation matrix. Section 6 is dedicated to a discussion of the results, including the sensitivity of the analysis, and Section 7 sets out next steps. The filters selected for inclusion in this desk review were identified through the HWTS Knowledge Base, the WHO International Scheme to Evaluate HWT Technologies (the Scheme), emergency response practitioner interviews and submissions to the Challenge. Filters on the HWTS Knowledge Base are identified on an ongoing basis through field observations, research papers, conference displays, manufacturer submissions and internet searches. An attempt was also made through internet research to identify any filters that had been used in recent emergency settings. However, this research did not identify any unique products, as the organizations that were found to have implemented filters in emergencies were also represented in the interviews and identified the same products. CAWST relied upon information and insight from emergency response practitioners to develop the weightings for the different criteria. This information was elicited through interviews. Nineteen interviews were conducted in total. The complete list of interviewees can be found in Appendix D. Respondents were recruited through CAWST, the HIF TWG and the Global WASH Cluster. For the most part, these interviews were held over Skype, with the exception being interviews with three CAWST staff who have prior emergency response experience. The initial five interviews were held in December 2016. The purpose of these interviews was to inform the development of the rubric and weighting methodology, and to investigate the differences between emergency contexts. Four scoping interviews were conducted in February 2017 to delineate important information about emergencies that would contribute to decision‐making and to define the different emergency scenarios that would be used in the weighting process. Based on the results of these nine interviews, four emergency scenarios (Appendix C) were developed. The scenarios were designed to be distinct from one another and to cover as wide a range of situations as possible; they were not meant to comprehensively describe all possible emergency situations. Based on what was learned in the initial interviews, an interview protocol was designed for theweighting interviews. For this, a survey was produced using the program SurveyGizmo. During the 4 interview, the enumerator shared screens with the interviewee to allow them to see how the numbers they had stated added up. As the first step in the weighting activity, respondents were introduced to the first emergency scenario and were given 100 points to distribute between the three parameter categories of: 1. Ease of Use, 2. Performance and 3. Logistics. These categories were established in the Handbook created by the HIF for use in all three calls of the Challenge. This process was repeated for the remaining three scenarios. In the second step, again starting with the first scenario, interviewees were provided with 60 points to distribute between the six criteria within each of the three categories. These criteria are detailed in Section 4. This process was repeated for the remaining three scenarios. The point values were later normalized based on the first step so that the weightings in each category summed to the maximum number of points the interviewee had allocated to that category for a given scenario. After going through the three categories for each of the four scenarios, the interviewees were returned to the first distribution of 100 points for the three categories in a given scenario. At this time, they were given the opportunity to adjust their response based on their greater knowledge of what criteria fell within each category. The majority of respondents did not find it necessary to adjust their responses. We categorized the 34 products included in this desk review by filter media type: ceramic pot, ceramic element, membrane and other. Below, we introduce the categories and then provide brief descriptions of each filter, organized alphabetically within each category. The complete evaluation matrix, including scoring of the filters according to the rubric presented in Section 4 can be found in Appendix A. Ceramic pot filters operate by water flowing through a porous ceramic filter pot and collecting in another container below. Two variations of ceramic pots – flat‐bottom and round‐bottom – are currently manufactured. The ceramic pot sits or hangs in the top of a larger plastic or ceramic container, typically 20‐30L in volume, which is fitted with a tap at the bottom. A lid is placed on top of the filter to prevent contamination. The system both treats the water and provides safe storage until it is used. Ceramic pots are usually made from local clay mixed with a combustible material like sawdust, rice husks or coffee husks. The clay and combustible material are sieved through a fine mesh and then mixed together with water until it forms a homogeneous mixture. The mixture is pressed into shape using a mold. When the pot is fired in a kiln, the combustible material burns out, leaving a network of fine pores through which the water can flow. Colloidal silver is often added to the clay mixture before firing or is applied to the ceramic pot after firing. Colloidal silver is an antibacterial agent that helps in pathogen inactivation as well as in prevention of bacterial growth within the filter itself. Some ceramic pot filters also include activated charcoal in the clay mixture to improve odour, taste, and colour. Ceramic element filters operate by water flowing through a ceramic wall, with the dimensions of the element varying depending on the specific product. The most common shape for these elements is a candle; however, several new products in the market are shaped like horizontal discs or cylinders. Ceramic elements are often coated with colloidal silver and sometimes have an activated carbon core. There are two main set‐ups for ceramic element filters. The first is a tabletop model with two stacked buckets and a filter element. Water must pass through the filter element to pass from the top bucket to the bottom, and filtered water is accessed from the bottom bucket with a tap. In some cases, the elements are procured separately and the filters are assembled on site using local buckets. This would require some drilling into the buckets. In other cases, the product is sold as a kit with the pre‐drilled containers included. The second set‐up is as a siphon filter. In this case, the filter element is enclosed in a plastic housing which is placed in a raised, untreated water bucket. A tube is connected to the filter and hangs over the bucket wall to outside of the bucket, terminating at a lower level than the filter element and feeding into a clean water container. With each new bucket of water, a siphon effect must be produced before filtration can occur. This is typically achieved by squeezing a bulb attached to the outlet tube. The following selection of products is not exhaustive but is intended to be representative of what is available on the market. Each of the manufacturers produces a range of products, such as different tabletop kits, separate candles, and siphon filters. Some manufacturers also produce versions that use a pump, are part of a water bag or connect to a kitchen faucet. Many countries also have local ceramic element manufacturers. Black Berkey Purification elements are produced by the US‐based company New Millennium Concepts Ltd. (www.berkeywater.com). The elements are sold in pairs and are made of carbonized coconut shell and other proprietary materials. For this evaluation, we considered a two‐element tabletop set‐up with 20L buckets. The Household Filter Kit is a tabletop filter produced in the UK by British Berkefeld (www.doulton.com). The kit includes 2, 3 or 4 ceramic candles, two 16L buckets with snap on lids, a dispensing tap for the storage container and the required hardware (e.g. washers and nuts) for installation. According to the manufacturer, kits sold for emergency response typically come with two silver‐impregnated Sterasyl candles. Therefore, we evaluated a two Sterasyl candle Household Filter Kit. cartridge is coated with colloidal silver and contains activated carbon in its hollow core. For this evaluation, we considered a Flex with one candle cartridge, which the manufacturer stated was typically requested for emergency response. The Stéfani candle cartridge is produced in Brazil by Stéfani Purificadores (www.ceramicastefani.com.br). Candle cartridges and taps are often sold separately and then installed in local buckets in a tabletop configuration. The Stéfani candle cartridge is coated with colloidal silver and contains activated carbon in its hollow core. For this evaluation, we considered a set‐up with two candle cartridge and two 20L buckets. The ImerPure is a tabletop filter that is produced in India by Imerys (www.imerys.com). The filter set‐up includes a two‐part cartridge, a 7L untreated water container, an 8L safe storage container with a tap and the necessary hardware for set‐up. The two‐part cartridge consists of a ceramic disc pre‐filter and bromine ion‐exchange beads. The Kohler Clarity is a tabletop filter produced by the US‐based company Kohler (www.clarity.kohler.com). The filter set‐up includes one cylindrical filter element, one 11L untreated water container, one 12L safe storage container with a tap and the necessary hardware for installation. The Rainfresh MP4U Gravity Filter is a tabletop filter produced by the Canadian company Envirogard Products Ltd. (www.rainfresh.ca). The filter set‐up consists of four silver‐impregnated ceramic cartridges, two 25L buckets, a spigot for dispensing water, a filter gauge, cleaning mesh and the necessary hardware for installation. The Rainfresh MP4U ceramic cartridges are produced by the Canadian company Envirogard Products Ltd. (www.rainfresh.ca). The silver‐impregnated ceramic cartridges and the spigot for dispensing water can be purchased and installed in a tabletop set‐up using separately procured buckets. For this evaluation, we assumed a set‐up of four ceramic cartridges and two 20L buckets. The Rainfresh GS7300G Siphon Gravity Filter is a siphon filter produced by the Canadian company Envirogard Products Ltd. (www.rainfresh.ca). The siphon filter uses a silver‐impregnated ceramic cartridge. Suction must be applied to initiate flow. For this evaluation, we assumed that one 20L bucket 7 for untreated water would be purchased and distributed in addition to the siphon filter. The Safi T9 is a tabletop filter manufactured in Malawi by Safi Water Treatment (www.safiwater.com). The filter set‐up consists of an imported ceramic filter element and tap, with necessary installation hardware, two locally produced 9L plastic containers and a locally produced filter‐cleaning brush. The ceramic filter element contains colloidal silver and activated carbon. The ceramic filter element used by the Malawi‐based Safi Water Treatment (www.safiwater.com) is imported. It contains colloidal silver and activated carbon. For this evaluation, we assumed one filter element installed in a tabletop set‐up using two separately procured 20L buckets. The Tulip Siphon Filter is a siphon filter produced by the Netherlands‐based company Basic Water Needs (www.basicwaterneeds.com). The siphon filter uses a Tulip ceramic candle element that is treated with colloidal silver and has a hollow core that contains activated carbon. A squeezable bulb built into the system is used to produce the siphon effect to initiate flow. It is sold with a scrub pad and pre‐filter. For this evaluation, we assumed that one 20L bucket for untreated water would be purchased and distributed in addition to the siphon filter. The Tulip Table Top is a tabletop filter produced by the Netherlands‐based company Basic Water Needs (www.basicwaterneeds.com). The set‐up consists of a Tulip ceramic candle element, two 10L containers, a tap, the necessary installation hardware, a scrub pad and a diameter check tool. The Tulip ceramic candle element is treated with colloidal silver and has a hollow core that contains activated carbon. membrane filter is in‐line with a pump or is housed within a container and inaccessible to the user. The 8 gravity‐driven filters include those where the membrane element is attached to a plastic tube and hung from the side of a bucket, which requires initiating a siphon effect, or is housed: within a backpack, in the top bucket of a two‐bucket set‐up, or most commonly, within a plastic cartridge that is connected to a tube and hangs from a hole in the bottom of a bucket. 1 Zevenhuizen, E. (2013) In‐line coagulation to reduce high‐pressure membrane fouling in an integrated membrane system (Master’s thesis, Dalhousie University, Halifax, Nova Scotia, Canada). Received from author. 2 Murray, A., Goeb, M., Stewart, B., Hopper, C., Peck, J., Meub, C., Asatekin, A. & Lantagne, D. (2015). Fouling in hollow fiber membrane microfilters used for household water treatment. Journal of Water Sanitation and Hygiene for Development, 5(2), 220‐228. Because the extent to which this issue affects the Sawyer PointONE filter and other household membrane filters is unknown, for the purpose of this desk review, filter lifespan was taken as the manufacturer claimed lifespan. Fouling and its impact on lifespan and performance was taken into consideration in Robustness, and the potential for membrane rupture was incorporated into the Fail‐ Safe criterion. All of these criteria are discussed in Section 4. It is important that, if any membrane products are selected for the Challenge, investigation of the fouling process and evaluation of risk of rupture is done on the selected products over an extended period of time in emergency settings. The ACI Household Filter one bucket set‐up is a tabletop filter manufactured by the US‐based organization Aqua Clara International (www.aquaclara.org). This configuration comes with two 0.1‐ micron hollow fiber membrane elements in a single PVC housing, a tap, necessary installation hardware, a 75‐micron pre‐filter screen and a backwashing syringe. The required bucket is procured separately. The filter unit is installed on the side of the bucket near the bottom, with the tap on the outside end so that water flows through the filter unit and out of the tap. For this evaluation, we assumed a 20L bucket would be purchased and distributed along with the filter. The ACI Household Filter two bucket set‐up is a tabletop filter manufactured by the US‐based organization Aqua Clara International (www.aquaclara.org). It comes with two 0.1‐micron hollow fibre 9 membrane elements in a single PVC housing, a tap, the necessary installation hardware, a 75‐micron pre‐filter screen and a backwashing syringe. This configuration is a typical two‐bucket set‐up. For this evaluation, we assumed two 20L buckets would be purchased and distributed along with the filter. The Grifaid Family Filter is produced by the UK‐based organization Grifaid (www.grifaid.org). The 0.01‐ micron filter membrane is contained within a pump unit that is placed within a bucket and then affixed to the bucket with the built‐in clamp. For this evaluation, we assumed one 20L bucket for untreated water would be purchased and distributed in addition to the filter. The LIFESAVER cube is produced by the UK‐based company Icon Lifesaver Ltd. (www.iconlifesaver.eu). This product consists of a 5L container with a pump and a built‐in 0.015 micron membrane cartridge at the outlet. LifeStraw Family 1.0 is produced by the Swiss‐based company Vestergaard (www.vestergaard.com). It consists of a 2L upper container, an 80‐micron pre‐filter, a meter‐long plastic hose and the 0.02‐micron membrane filtration cartridge. Backwashing is achieved by squeezing a red bulb at the bottom of the filter cartridge. The LifeStraw Family 2.0 is a tabletop filter produced by the Swiss‐based company Vestergaard (www.vestergaard.com). It consists of a 5L top container, an 80‐micron pre‐filter, a 0.02‐micron membrane filtration cartridge and a 5L safe storage container. Backwashing is achieved by pulling a red lever on the bottom container. The Sawyer PointONE filter is produced by the US‐based company Sawyer Products (www.sawyer.com). It consists of a plastic‐encased 0.1‐micron membrane filter cartridge, plastic tubing, the necessary installation hardware and a backwashing syringe. A separately procured bucket is required for installation. For this evaluation, we assumed a 20L bucket would be purchased and distributed along with the filter. The Sawyer Point ZeroTWO filter is produced by the US‐based company Sawyer Products (www.sawyer.com). It consists of a plastic‐encased 0.02‐micron membrane filter cartridge, plastic tubing, the necessary installation hardware and a backwashing syringe. A separately procured bucket is required for installation. For this evaluation, we assumed a 20L bucket would be purchased and distributed along with the filter. The Tapp filter is produced by the Canadian company Tapp Global (www.tappglobal.com). It consists of a 0.2‐micron membrane filter cartridge, plastic tubing and a metal hook for hanging the tubing from the side of a separately procured bucket. A siphon effect is created using the filter’s built‐in pump mechanism, which also backwashes the membrane. For this evaluation, we assumed a 20L bucket would be purchased and distributed along with the filter. The UZima Filter UZ1 is a membrane filter cartridge produced by the Kenya‐based organization UZima Water Filters (www.uzimafilters.org). The UZ1 filter kit includes a 0.1‐micron membrane filter element, taps, the necessary installation hardware and a backwashing syringe. It is intended for use as a two bucket tabletop set‐up, with the buckets procured separately. For this evaluation, we assumed two 20L buckets would be purchased and distributed along with the filter. The UZima Filter UZ2 Backpack is a membrane filter set‐up produced by the Kenya‐based organization UZima Water Filters (www.uzimafilters.org). The UZ2 consists of a 0.1‐micron membrane filter element fixed to the inside of a 20L vinyl backpack, a backwashing syringe and a separate vinyl backpack with a tap for safe water storage. The VF 100 Village Bucket Filter is produced by the US‐based non‐profit Village Water Filters, Inc. (www.villagewaterfilters.org). It consists of a plastic‐encased 0.1‐micron membrane filter cartridge, plastic tubing, the necessary installation hardware and a backwashing syringe. A separately procured bucket is required for installation. For this evaluation, we assumed a 20L bucket would be purchased and distributed along with the filter. The VF 100 Village Bucket Filter is produced by the US‐based non‐profit Village Water Filters, Inc. (www.villagewaterfilters.org). It consists of a plastic‐encased 0.1‐micron membrane filter cartridge, a carbon‐ and silver ion‐infused foam pre‐filter, plastic tubing, the necessary installation hardware and a backwashing syringe. A separately procured bucket is required for installation. For this evaluation, we assumed a 20L bucket would be purchased and distributed along with the filter. The WATERisLIFE Nano Bucket Filter is produced by the US‐based organization WATERisLIFE (www.waterislife.com). It consists of a plastic‐encased membrane filter cartridge, plastic tubing, and the necessary installation hardware. A separately procured bucket is required for installation. Backwashing is achieved by reversing flow through the filter unit. For this evaluation, we assumed a 20L bucket would be purchased and distributed along with the filter. The biosand filter (BSF) is an adaptation of the traditional slow sand filter and is intended for use at the household level. A concrete BSF consists of a diffuser plate or box and a concrete filter box that is filled with layers of sieved and washed sand and gravel (the filter media). The concrete filter box is produced locally, using local materials, and the filter media is locally procured. The DayOne Waterbag is a flocculation‐disinfection‐filtration system produced by the US‐based company DayOne Response, Inc. (www.dayoneresponse.com). The Waterbag consists of a 10L plastic bag with a roll and clip closure, backpack straps for carrying and an attached filter that the water passes through after batch treatment. The Waterbag comes with an initial supply of 60 P&G Purifier of Water flocculant‐disinfectant packets and a backwashing syringe. The Hydraid Biosand Filter is sold by the US‐based company NativeEnergy (www.nativeenergy.com). The filter consists of a plastic diffuser and container, which are produced in the US by Cascade Engineering, and locally procured sand and gravel. The Gift of Water Filter is a multi‐step filtration unit produced in Haiti by the US‐based organization Gift of Water (www.giftofwater.org). It consists of two 20L buckets connected by a check valve, with a 5‐ micron or 1‐micron string filter installed in the bottom of the top bucket and a cylindrical container filled with granular activated carbon installed on the underside of the top of the bottom bucket. Water is collected from a tap installed in the bottom bucket. Two differently sized chlorine tablets are used for the two buckets, with contact time required. For this evaluation, we assumed use of the 1‐micron string filter. The Rorus Core is a filtration cartridge produced by the US‐ and India‐based company Rorus Inc. (www.rorusinc.com). The cartridge contains a nanomaterial that relies upon static charges to attract and remove pathogens; it also contains powdered activated carbon. The cartridge is sold with the tap and hardware for installation in two locally procured buckets, in a tabletop configuration. For this evaluation, we assumed two 20L buckets would be purchased and distributed along with the filter. The Rorus Spring is a tabletop filter produced by the US‐ and India‐based company Rorus Inc. (www.rorusinc.com). Its treatment unit is the Rorus Core cartridge, which contains a nanomaterial that relies upon static charges to attract and remove pathogens. The cartridge also contains powdered activated carbon. The set‐up consists of the Rorus Core cartridge and two containers approximately 10L in volume, with a tap and installation hardware for the bottom container. 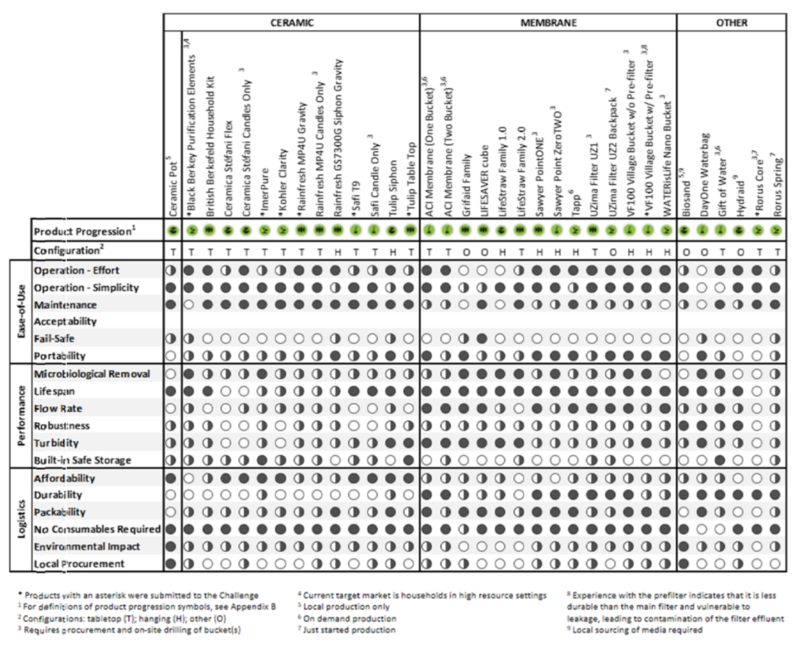 In the Challenge Handbook, HIF sets out 16 ideal filter features and capabilities (called criteria hence forth), split into three categories – Ease of Use, Performance, and Logistics – against which filters were to be compared during the shortlisting process. In the following sections, we follow the same organizational structure when presenting the areas of focus and the criteria within them. For each of the criteria, we then provide the description from the Handbook before explaining how we applied it to the filters under consideration. Because of the complex, interwoven nature of many of the criteria, we found it necessary to clarify and/or simplify some of them in order to avoid overlap between criteria while also ensuring consistency across criteria. In two instances, this meant breaking one criterion into two; in another instance, we felt the need to create a new criterion for portability, which is discussed later. Finally, we provide the rubric used to evaluate the filters within a given criterion, which consists of scoring from 1 to ‐1, where 1 is optimal, 0 is sufficient, and ‐1 is poor, and a definition for each score. This rubric was developed based on the Handbook criteria, CAWST expert knowledge and experience, and information gathered from interviews with emergency response practitioners. In the case of Acceptability, there was insufficient information on this criterion across a majority of filters, which meant that we were unable to develop and apply a rubric. We provide further explanation in the relevant section. For Operation, we excluded filter cleaning and maintenance, as this is captured in Maintenance, below We separated Operation into two sub‐criteria: Effort and Simplicity. As the first element of Operation, we considered the effort required to treat the water, that is, the physical exertion required and the number of batches of water that must be treated to provide 12.5L3 of water. 12.5L was used as the target volume in order to parallel the daily volume required for a family of 5, as designated in Treatment Capacity, which is presented later under Performance. We assume that, for filters that require buckets, these buckets are procured locally and are 20L in volume. Because the majority of filters are gravity based, we assumed that the difference in effort required between filters to raise a bucket when filling the untreated water container was minimal. 3 The volume of 12.5L (2.5 L per person per day for a family of 5) was established by the HIF for the Challenge. In development, 20L is more commonly used for the daily household treated water requirement. For the second element of Operation, we considered Simplicity by asking, “How straightforward and intuitive is the treatment process?” This included the number of steps one must take to get from untreated water to consumption of treated water and the potential for user error. We determined the evaluation of instructions for use and maintenance to be outside of the scope of this desk review. Instructions can be modified by the manufacturer or implementing agency. We defined Maintenance as the complexity of the maintenance required to ensure optimal performance of the filter, as detailed by the manufacturer. We excluded replacement parts and consumables, as they are captured in Consumables, and associated costs, as they are captured in Affordability. We consider requirements for replacement parts or repair under Durability instead of Maintenance. All of these criteria are presented later. Information on acceptability was not readily available for most filters, and the factors that influence acceptability differ greatly between contexts. Expert interviews and field reports provided insight into the acceptability of several filters. However, because such information was not consistently available across all filters, we did not evaluate filters against this criterion. CAWST’s understanding is that this lack of information on acceptability of HWT filters in emergencies was, in large part, the motivation for the Challenge. Our desk review confirms that a methodology to evaluate acceptability that can be applied across filters and emergency settings is needed. Furthermore, the sector would greatly benefit from the information on acceptability resulting from a field evaluation of filters using such a methodology. The majority of filters included no such mechanism. The rubric we established, therefore, is a comparison of the modes of failure and the means of determining failure, if such means exist. For example, although many membrane filter manufacturers point to reduced flow rate at end‐of‐life as an indicator, membrane rupture is possible in units requiring backwashing, which would lead to increased flow with no other indication of failure.4 As end users are likely see increased flow as a positive outcome, we determined that this was not a sufficient indicator of failure. Furthermore, membrane rupture leads to the provision of untreated water, or perhaps water that is even more contaminated than the untreated water due to exposure to contamination (e.g. biofilm growth) when passing through the ruptured filter. With regards to ceramic candle filters, many manufacturers provide a tool to check the diameter of the ceramic candle element. However, failure points such as small cracks in the filter element or short‐circuiting of the untreated water made possible by loosening of the candle during cleaning over time are likely to occur before the diameter check is useful in signaling end of life. None of the filters considered required electricity. Based on the findings of the desk review and expert interviews, we are of the opinion that any filters submitted for the call that do require electricity should not be considered. This criterion was added by CAWST in order to capture the ease with which the end user could transport the filter after implementation, that is, when a household relocates (e.g. from a camp back home), not when the filter is moved short distances (e.g. within the house or compound). This was not captured in Packability, which is discussed later in the section on Logistics. In the original call, this criterion was entitled Treatment Capacity. For the purpose of this study, we changed the title to Lifespan. In evaluating Lifespan, we considered the capacity of the filter element that is the means of treatment. Therefore, for the purpose of this study, ceramic candle filter elements were not considered as consumables but rather as a filter with a limited lifespan. Products such as chlorine tablets, flocculants, or flocculant‐disinfectants that may be required for the treatment process were considered in the Consumables criterion. Evidence on Lifespan outside of manufacturer claims was not consistently available across filter products. Therefore, we used the manufacturer stated lifespan when evaluating filters against this criterion. Lifespan reported by the manufacturer is typically determined using water with low turbidity. Lifespan in the context of higher turbidity source water (>50 NTU) is accounted for under Robustness, which is discussed in a later section. Several interview respondents set the minimum acceptable lifespan at six months, while one set it at three months. Therefore, less than six months was set as “poor” within the rubric, and less than three months was set as the exclusion criterion. That is, any filter with a lifespan less than three months was not considered in this evaluation. In the original call, this criterion was entitled Flow Rate. For the purpose of this study, we changed the title to Time to Treat, as two of the filters considered in this desk review included a batch treatment step with chlorine or flocculant‐disinfectant before filtration. The time required for batch treatment was incorporated into our calculations of L/hr for these products. When possible, we evaluated time to treat in‐office and/or corroborated manufacturer claims with field reports. Based on expert interviews, we determined that 0.5L/min or faster would be ideal. Specifically, it would allow users to collect treated water from the filter directly into a cup for immediate drinking as opposed to requiring the treated water to be collected in a storage container over a longer period of time. This time to treat was established as “optimal.” Based on the Handbook’s definition, we established the “sufficient” level of the rubric at 20L in 12 hours, or 1.7L/hr. We excluded products unable to produce 12.5L in 24hrs, which is taken from the Lifespan requirement of providing water for a family of 5, with each person needing 2.5L/day. For Robustness, we considered the effect of a turbid water source on product lifespan and performance. Evidence on the impact of turbid water (>50 NTU) on lifespan and filter performance (i.e. the ability to provide a consistent quantity of water) was not consistently available across filters. As a result, we reached out to manufacturers to request further information. In some cases, manufacturers responded by saying that their product was not recommended for >50 NTU source water. This response was designated as the “poor” level within the rubric. Many manufacturers responded by stating that turbidity would not decrease lifespan but rather would simply increase the frequency of maintenance required. Such maintenance (i.e. scrubbing of a ceramic candle element, backwashing of a membrane filter), they said, could be performed in order to re‐establish an acceptable flow rate. Our understanding based on our experience, the interview responses and other available information, however, is that such maintenance cannot always fully re‐establish the desired flow‐rate and/or may itself reduce the lifespan of the filter. For ceramic candle filters, silt and other inorganic constituents could be addressed relatively easily by light scrubbing. Organic constituents, on the other hand, encourage biological growth on the filter elements. This biological growth would require more rigorous scrubbing of the filter elements to achieve removal and re‐establish flow rate. Increased frequency and/or rigorousness of scrubbing, in turn, would lead to an increased rate of wear on the ceramic candle element. At a certain point, the walls of the element would be too thin to achieve sufficient microbiological removal, which is why many manufacturers provide a tool to measure element thickness to determine when replacement is necessary. Backwashing does not address irreversible fouling, so in the case of irreversible fouling, flow rate would continue to decrease over time in spite of repeated maintenance. Information on filter performance with regards to removing turbidity was not consistently available and was not comparable across filters when it was available. Therefore, for the purpose of evaluation against this criterion, we considered whether any additional pre‐treatment steps outside of the standard operation procedure were required to filter >50 NTU source water. In some cases, manufacturers responded to this question by saying that their product was not recommended for >50 NTU source water. This response was designated as the “poor” level within the rubric. We defined the Safe Storage rubric in a way that separated it from Time to Treat (i.e. a filter with a flow rate fast enough to provide water for immediate consumption) and from Operation and Maintenance. We evaluated Affordability as the cost for the manufacturer stated Lifespan of the filter (for a maximum of one year), including replacement parts and consumables. When requesting pricing from manufacturers, we asked for Ex Works or Free on Board pricing to make the prices as comparable as possible. For filters requiring separate procurement of bucket(s), we used a conservative estimate of $5/bucket. The $20 criterion as described in the Handbook was used as the “optimal” level of the rubric, while information collected in expert interviews was used to determine the “poor” level of >$60. There was limited information available on Durability of many of the filters considered, but we combined our in‐house experience with in‐office testing to consider a number of factors when evaluating Durability. These factors included: number of components; quality of components; fragility of components during transport, use and maintenance; quality of connection between components; and the presence of moving parts. Although this means of collecting information was sufficient to evaluate the filters against this criterion in the matrix, there is a need for systematic, well‐documented evaluation of filter durability in the field. The space occupied by the filter during transport was excluded from Durability and included instead in Packability, below. For Packability, we considered the volume and weight of complete filter set‐ups from the in‐country deployment location to the response location. This meant that, for filters requiring separate procurement of 20L buckets, the volume and weight of both the filter element(s) and bucket(s) were taken into account. Manufacturer responses regarding the volume required relied upon a range of metrics (e.g. 20‐ft containers, 40‐ft containers, pallets of varying heights, boxes of different shapes and dimensions), which made it difficult to compare the exact volumes required. Therefore, we developed a rubric that relied upon a relative comparison as opposed to precise calculations. Consumables were defined to be special products required for the operation and maintenance of the filter over one year, excluding household items such as washcloths, soap and bleach and excluding the filter element. Several filter elements had lifespans of less than one year and would require replacement. This requirement is captured under Lifespan. Based on the findings of our desk review and interviews with experts, Sustainability has been minimally considered and evaluated to date, and it is not presently prioritized by the sector. For the purpose of this evaluation, we considered two aspects of sustainability by which we could evaluate all of the filters considered: Environmental Impact of Disposal and Local Procurement. For Environmental Impact of Disposal, we considered whether it was possible to continue use of the filter by replacing the filter element or whether it was required that the whole product be discarded upon the end‐of‐life of the filter element. We also considered the volume of plastic disposed of upon end‐of‐life, whether it was just the filter element or the whole product. Sustainability also considers the long‐term viability of the project. Ideally, the introduction of a household water treatment technology would lead to continued use of the technology after the emergency. This can be facilitated by the use of locally available products. In addition, local procurement reduces the environmental footprint by not relying on the international shipping of products. It also injects money into the local economy. The results of the weightings applied to the matrix are presented below, by emergency scenario (see Appendix C for the four scenarios). The three filters with the highest scores for a given scenario were identified by applying each interviewee’s weighting responses to the matrix. With the ten interviewees, this resulted in a list for each scenario with at least 30 filters (in the case of ties for an interviewee, both filters were included on the list, leading to more than 30 listed in most scenarios). The tables below indicate the number of times that a given filter appeared on this list (i.e. how many of the interviewees’ weighting responses resulted in that filter being in their top three). The filters are organized first by the number of times they appeared in the top three by the different expert weightings, then by alphabetical order. For Scenario 1, Microbiological Removal had the highest average rating amongst the interviewees (mean = 11%). However, this factor also had the highest range (0% to 40%) and standard deviation (11%) between responses. Some interviewees expressed that, in an outbreak situation, it is critical to have the highest possible level of water quality. Others expressed that the existing cut‐off criterion for bacterial removal in the matrix was sufficient to reduce cholera, and that it was more critical to focus on Ease of Use to ensure correct, consistent, continuous use. The criterion with the lowest average weighting was Environmental Impact of Disposal (mean = 1.8%). Many interviewees noted that in an emergency where there is a loss of human life, environmental impact takes on a lower priority than it may in a more stable situation. Portability was also weighted low, as the population was assumed to still be in or next to their homes, eliminating the need for easy moving of the filter. The factor with the lowest standard deviation was Lifespan (mean = 3.1%, standard deviation = 1.7%). For Scenario 2, the highest average weighting was for Operation‐Simplicity (mean =11%) while the lowest was for Environmental Impact of Disposal (mean = 2%), followed by presence of a Fail‐Safe mechanism (mean = 4%). Some interviewees commented that, although a Fail‐Safe mechanism would be desirable, they did not weight it higher as they did not know of any existing filters with such a mechanism, and so would prefer to use their points elsewhere. The highest standard deviation and range were for Portability (standard deviation = 6%, range 20% to 0%), with the greatest agreement for Environmental Impact of Disposal (standard deviation = 2%, range 0% to 5%). For Scenario 3, the criterion with the highest average weighting was Maintenance (mean = 11 %), and the criterion with the lowest average weighting was Turbidity (mean = 1.5%). The low weighting for Turbidity in this scenario was because the water source was specified to be of low turbidity. The criterion with the greatest agreement in weighting was Packability (mean = 3%, standard deviation = 1.5%). The criterion with the greatest disagreement was Microbiological Removal (mean = 8%, standard deviation = 7%, range = 0% to 20%). For Scenario 4, the parameter with the highest average weighting was Portability (mean = 16%) with the lowest being Environmental Impact of Disposal (mean = 1%). The greatest agreement was for Environmental Impact of Disposal (standard deviation = 1%, range = 3% to 0%), while the greatest disagreement was for the need for no Consumables required (standard deviation = 13%, range = 3% to 26 50%). 6 Brown, J., & Clasen, T. (2012). High adherence is necessary to realize health gains from water quality interventions. PLoS One, 7(5), e36735. The criteria established by the HIF TWG for the Challenge aim to incorporate this critical element, but until use and acceptance are monitored in the field, this analysis is incomplete. In addition, the appropriateness of any HWT product varies from situation to situation based on influent water quality and recipient population characteristics, including their prior practices and preferences.7 Although one interviewee commented that they did not think that differences between the emergency scenarios played a large role, the results of the weighting analysis from the other interviewees indicated that characteristics of the specific emergency were important for most interviewees in product selection. 7 Lantagne, D.,& Clasen, T.(2012). Point‐of‐use watertreatment in emergency response. Waterlines, 31(1‐2), 30‐52. Several interviewees commented that, for certain scenarios, they did not feel that household filtration was an appropriate intervention. Although this particular challenge looked specifically at filtration, an emergency WASH responder has many more options at their disposal and must make an informed decision based on their particular situation and experience. Overall, there was little consensus among the interviewees as to the importance of the different parameters in each scenario. This lack of consensus can be seen in the long list of different filters in each scenario that appeared in at least one interviewees’ top three. In addition, although counts such as seven appear high, that same count – the highest count for a filter in Scenario 1 – indicates that the given filter was not within the top three for three of the interviewees. For the other seven, it may not have been their highest selection. In contrast, although a filter may only have had a count of one, it may have been the top choice for an interviewee based on their weightings. As such, the list may have differed greatly for a different ten interviewees. The exception to this variability is that for the two scenarios with water specified as turbid (Scenarios 2 and 4), all interviewees rated Turbidity highly relative to most other parameters. For Scenario 4, all interviewees rated Portability highly. Despite this variability, two filters appeared frequently, that being the ACI Filter (One Bucket), and the Village Bucket Filter without pre‐filter. For Scenario 4, these two filters were identified in the top three based on weightings for all ten interviewees. These same two filters also appeared on most interviewees lists for all of the other three scenarios. Most interviewees gave Environmental Impact of Disposal a low weighting for all scenarios. This uniformly low weighting meant that the analysis was not sensitive to this parameter. Several interviewees indicated that they felt embarrassed to give it such a low rating and theoretically believed it to be important, but that the reality of an emergency is that saving lives is more important than environmental impact. The analysis was highly sensitive to some of the parameter definitions within the rubric. If, for example, the HIF TWG had defined the desirable filter price as $25 USD instead of $20 USD, several filters that were themselves below $20 USD but required one or two buckets at an assumed cost of $5 USD per bucket, would have risen in the rankings. A change in the assumed cost of a bucket to $2.50 USD would not have had a significant impact on rankings. However, the assumption that households could provide their own bucket would have had a large effect in filter classifications within Affordability as well as in the definition of Packability, both of which had high enough weightings in some scenarios with some interviewees that it may have changed which filters showed up in their top three. In contrast, the rubric was not sensitive to Time to Treat. There was a clear delineation between the technologies in terms of Time to Treat, with no technologies on the edge of that delineation. The rubric was also not very sensitive to Microbiological Removal. Most manufacturers did not claim to remove viruses or provide independent testing results on this; in the instances where independent testing results on virus removal were provided, these filters generally exceeded the HIF TWG’s desired removal levels. A limitation of the matrix is that in order to make the rubric as clear as possible, it was necessary to limit several criteria. One such example is in regards to the complexity of filter distribution and installation. For example, many filters required drilling of buckets for installation of taps and filter elements. This would increase the complexity of a filter distribution project, with the need for a greater amount of in‐ field preparatory work. Some filters were specifically designed to eliminate that need (e.g. siphon filters, Tapp Filter, Grifaid Family Filter) and could use any existing water collection container without the need to modify or damage that container by drilling. The rubric did not account for the potential benefit of such an installation, especially in terms of not requiring the distribution of buckets in some scenarios, thus improving Affordability and simplifying Packability. Local Procurement was a complicated parameter. It may be positive in that, if a community was already using and producing a particular type of treatment and production was not affected by the emergency 28 scenario, procuring the treatment locally would have the potential to simplify logistics, reduce costs, and contribute to the local economy. On the other hand, in the case where the emergency has impacted production and/or the supply chain, the need to locally procure elements of the filter, such as buckets, might increase the complexity of the emergency response and be considered negative. The rubric did not capture the full complexity of this parameter, which may differ from situation to situation. One of the most important parameters, which received high weightings from all interviewees, was Acceptability. However, as data is lacking on this parameter, it could not be incorporated into the matrix. Further research on how populations relate to the HWT products, including adoption (at one month) and sustained use (at one year or more) is lacking for most of the products, especially within the emergency context. As mentioned above, Acceptability was weighted highly by most interviewees but was not able to be incorporated in the matrix due to limited evidence. The next step within the Challenge is for the HIF TWG to select filters for field testing. It is hoped that the matrix and this supporting report assist the HIF TWG in their selection. The feasibility of the manufacturer to produce a sufficient quantity of filters in a short time span or have enough of them stockpiled to enable immediate mobilization for an emergency response was not included in the matrix other than as a footnote for some filters. This was intentional, as the filter challenge was meant to include new and promising products. If the product were to be successfully tested within this challenge, the added profile may allow a small manufacturer to scale up their product to the extent necessary to provide for emergency response in the future. As such, this parameter will need to be revisited in the future, after the next steps of the Challenge are complete. Exists beyond the prototype stage and is developed to be appropriate and affordable for household use in low‐resource settings. Meets the “emerging” requirements; has undergone independent water quality testing; and has been implemented beyond the pilot scale in a development or emergency context. Meets the “tested” requirements; has undergone independent testing of water quality, adoption, and use in the field; is used in multiple countries; and has garnered the attention of HWTS practitioners. Meets the “adopted” requirements; has been tested for sustained use in the field; has been in the sector for at least 5 years.